Card Review: 8.6 I actually kind of like this card, despite it being the type of product I'm usually predisposed to abhor. 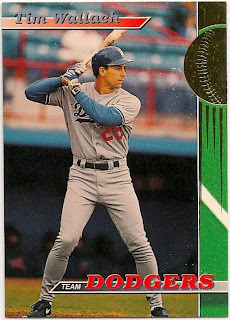 I've never seen any other cards from this set, am not entirely sure that I'm calling it by the correct name, have simply labeled it based on how the person I bought it from described it. It could be something completely different for all I know. I have no idea who or where these were sold, I just know I never saw any back in 1993. I'm assuming they were issued as team sets, but that's pure conjecture based on a name. A name that I'm not even entirely sure is correct. It's from a 1993 Stadium Club Dodgers team set. Don't really understand the dressing on it tho. 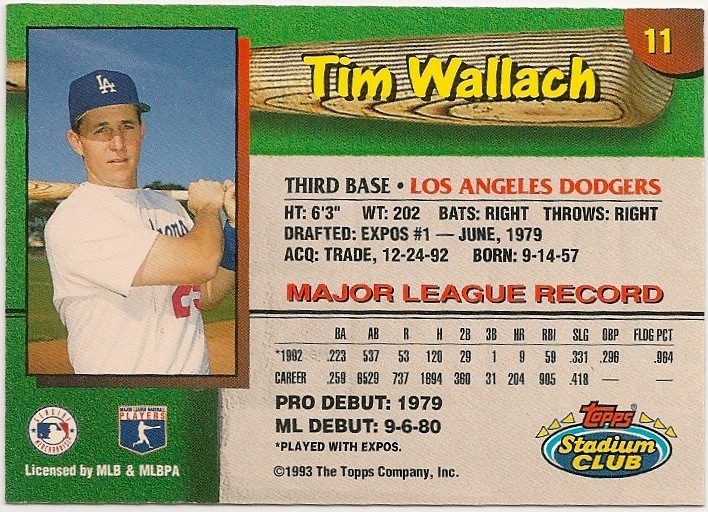 I like Wallach's base card quite a bit more.